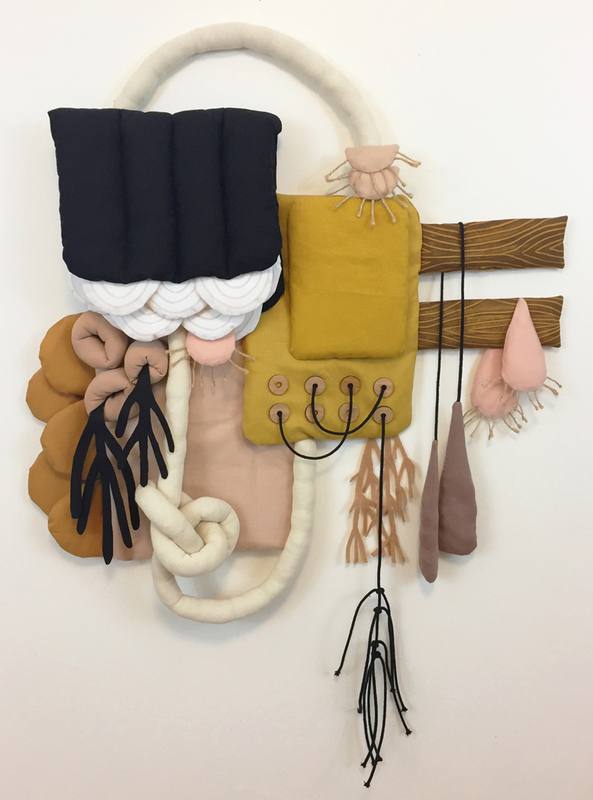 TAMARA BAGNELL's soft sculptures are playful systems made of fabric, felt, wood, rope and polyfil. 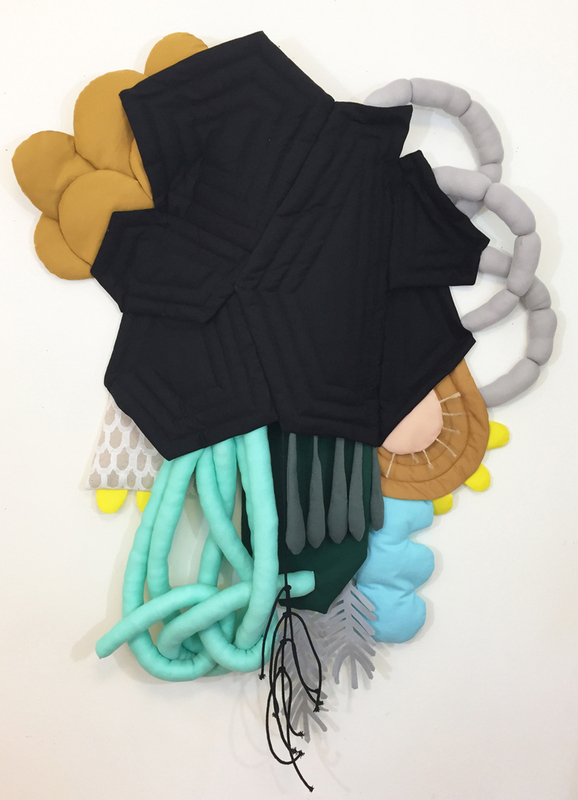 They teeter between abstraction and representation, and the meaning of her recurring forms—drops, vines, concentric arches, stuffed tubes—shifts as her palette does. Tamara earned her BFA in Interrelated Media from Massachusetts College of Art and Design in 2001. She ran a textile design and screenprinting business until 2016, when she turned to art-making full time. 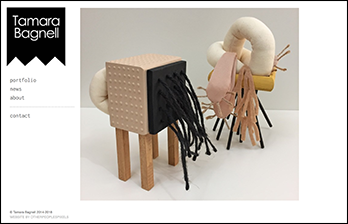 Her artwork has most recently been exhibited at the Durham Arts Council, in soft goods (2018) at VAE Raleigh, and The Art of a Scientist (2018) at The Rubenstein Art Center at Duke University. Tamara lives and works in Durham, North Carolina. OtherPeoplesPixels: What does soft mean to you? 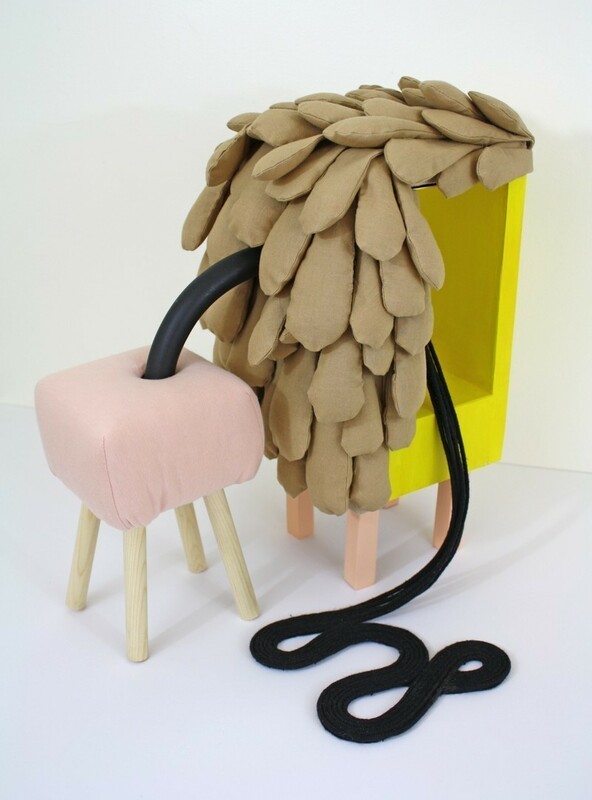 Tamara Bagnell: Soft is approachable, playful, familiar, empathetic. Soft is both malleable and resilient. Softness has an open quality, an ability to draw the viewer in. It also creates a lightness to elements of my work that if made from other materials might read as more serious, sinister, or aggressive than I intend. OPP: Have you always worked in soft sculpture? 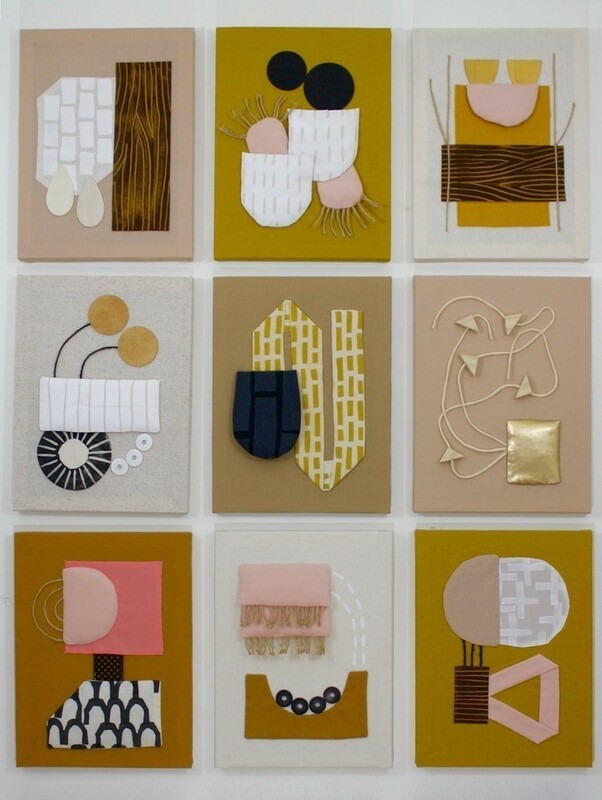 TB: My background is predominantly in screenprinting and textile print design, although I find my soft sculptures incorporate a lot of the aesthetics that drew me to screenprinting: bold blocks of color, repetition, abstraction. I also occasionally use screen and block printing to embellish the fabric I use in my pieces. My path as an artist is maybe a bit different than others. After receiving my BFA in 2001, I turned my focus away from making fine art and ran a more design-oriented business. During that time, I still worked with fabric and occasionally experimented with soft sculpture, but I was never happy enough with the result to exhibit my work. 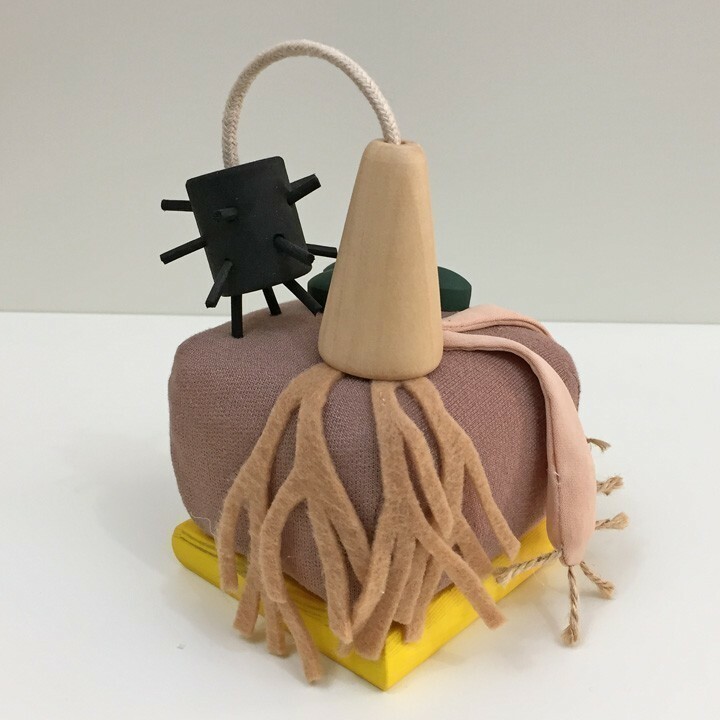 It is only over the past few years that my approach to art making has really come together for me, and soft sculpture has begun to permeate my work. OPP: When and why did you learn to sew? TB: Sewing is a tradition in my family. Growing up, there was a sewing machine that lived in the dining room of my home. My mom learned how to sew from her mom, and I would watch her make me tops and dresses when I was elementary school age. I’d also tag along on trips to the fabric store and pass the time exploring all the colors and textures. I began nagging her to teach me how to use her machine when I was maybe in fifth or sixth grade. My motivation was to be able to design my own clothes, which not surprisingly turned out to be a lot harder than I anticipated. I stuck with it though and gained a modest level of expertise through decades of practice. While my interest in making clothing ultimately waned, the skills I gained through learning those techniques are something I’ve continually found new ways to tap into. People often comment when seeing my work in person about how meticulous my construction is, and I think that has a lot to do with all that experience making clothes and accessories. OPP: Your color palette is pretty consistently neutral with accents of pink and yellow hues. What draws you to these colors? TB: I am completely obsessed with color, and it is one of the most important parts of my process. I have a strong emotional connection to certain colors that I find difficult to describe in words. Yellow is one of those colors. Since my work is mostly abstract, I often use color as a way to nudge the viewer to interpret important elements of a piece in a particular way. A drop-like shape in beige or peach is more likely to read as flesh. Whereas if I make it blue, it becomes water, or green a leaf, red might be blood or a fruit. For me, the pinks and neutrals have a flesh-like, organic quality, representing the elemental parts of living beings. I see these elements as embodying both the physical as well as the emotional, the parts of us that are affected when we feel. Lately my I’ve been focused on the interconnection between humans and systems, whether natural or human-created, so there has been a lot of pink, beige, and brown. It can be a struggle though, at times, finding harmony between using color in a representational way and also making sure the color works for the piece overall. It is very important to me that each piece I make can also be appreciated on a purely aesthetic level, and color is a key component in that. OPP: The obvious exception is natural order (2017). That blue background changes some neutral colored forms that show up into other works by introducing the context of the sky, which makes weather systems. What led you to make that change? Is it an anomaly or a new direction? TB: At the time I finished that piece it was an anomaly, but later on it became a point of departure. It was both an early attempt at making a wall piece and an experiment with color. In the end I wasn’t entirely happy with the result, but that piece and wide open became the inspiration for a series of more free form wall sculptures that I am working on now. system 1 and system 2 are part of that series, and I have four more that are at various stages of completion. As I progress through those pieces I have found my palette shifting, adding more blues and greens, playing with the symbolism of color and how I can utilize that to expand my language of shapes. 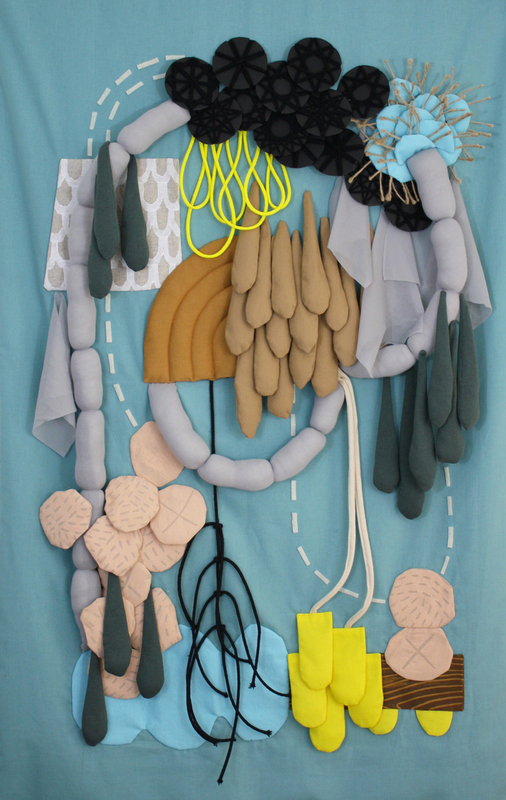 system 4, 2018. fabric, polyfil, cotton batting, jute. 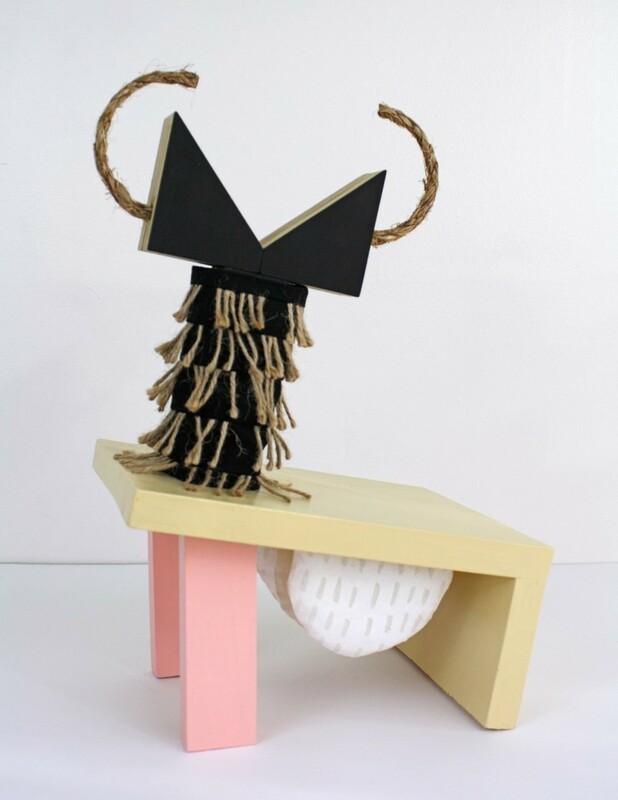 OPP: Do you reuse parts of your sculptures or make the same form over and over again? That pink string of “sausage links,” for example shows up in hidden (2018), system 2 (2018) and dark machines (2018). TB: I almost always make new forms for each sculpture. Occasionally I will disassemble a less successful piece and harvest it for parts. I also have a huge bin full of cast-offs that I can pull from when working on a composition. Since it’s rare that I start out with a sculpture fully laid out in my head, I manufacture each of the elements as I’m composing, with the hope they will look the way I envision when I incorporate them into the sculpture. If not, they go in the bin and often end up in a future piece. OPP: Can you talk about what some of the recurring forms mean to you? TB: A lot of the reason I make and repeat certain shapes again and again is because they simply appeal to me on some intuitive level, but over time they have sorted themselves into a kind of personal language with meanings that shift depending on color or context. I see most of the recurring elements in my current work as either organic forms—existing in some vague place between internal body parts, plants, seeds, and other objects in nature—or rigid, inorganic, machine-like forms. Some sculptures are cryptic systems comprised of mostly organic elements. In others, organic elements are being confined, generated or processed by human-made objects or machines. Some of these systems appear harmonious, while others seem sinister, chaotic or adversary. This stems from my larger fascination with interconnectivity, whether it’s contemplating the incredibly complex web of the natural world or questioning the systems we create and the corresponding rules we subscribe to as a society. Exploring these ideas in soft sculpture allows me overlay those thoughts and emotions with a certain playful quirkiness that I really enjoy. That said, I’m not overly concerned that people viewing my work infer any of these things or feel any pressure to “get it.” Ultimately I want my art to feel open and approachable, something to enjoy and explore, and take as much or as little as you want from it. To see more of Tamara's work, please visit tamarabagnell.com.